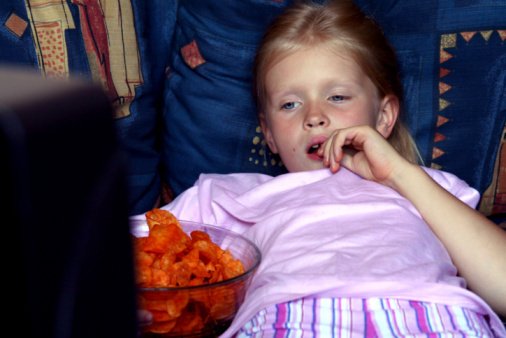 You probably know that lots of screen time is not good for kids, mentally or physically. However, even kids with limited screen time are still exposed to advertising for foods and beverages that are often lacking in nutrients and high in calories, sugar and sodium. The average child will see 10 to 13 advertisements per day for some type of food and beverage. Research shows that kids are easily influenced by these advertisements. Here are three ways to limit your child’s screen time and the resulting exposure to advertising. Turn the TV Off During Meals. Agree with your family not to watch tv or use other electronic devices while eating. Eating together regularly is a great way to bind as a family, and it is easier to pay attention to what you are eating when there are fewer distractions. When you are not eating, set limits around screen time. An hour a day is plenty. Watch Children’s Programs Without Ads. If there are shows your children are set on seeing, consider pre-recording them so you can forward through ads. Watching shows on public television stations is another option. Be a Good Role Model. Model good screen behavior for your children. Limit the amount of time you spend on your phone once you are done with work. Engage in activities that do not involve screens or TV. For example, initiate a family walk after dinner, and plan weekend activities that get the whole family outside. Limiting screen time can be challenging, especially as technology moves into every aspect of our lives. However, the benefits to your family’s long-term health are worth setting up routines and activities that limit TV and exposure to advertising. Find out how KareBoost Health can help you live a healthier life, without drastic changes or diets. We are here to help you make positive change!